The Panel menu is located on the right side of the screen. This Panel menu breaks down the process of designing a project into steps. It manages the entire design process for you, allowing you to efficiently design your project. It also contains all of the tools and content you will use. 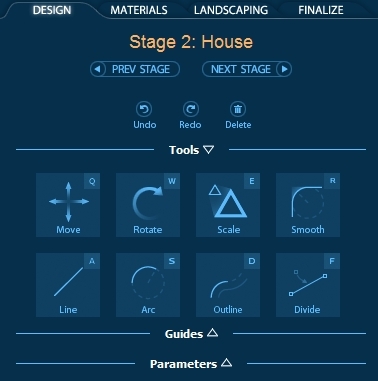 The panel displays different tools and options for each stage. For more information, go to Panel. When drawing large shapes or landscaping a yard, it may be convenient to change the scope of your view. The Zoom Tool adjusts the viewport magnification of the entire project, in effect showing more or less of the project as a whole. Activate the Zoom tool and position the cursor in the viewport. Click and hold the left mouse button, move the mouse upwards or downwards to zoom in or zoom out. 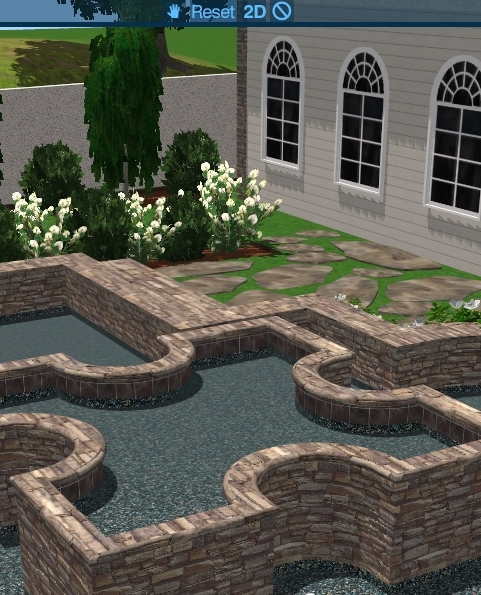 To focus on the pool, left-click once on the RESET button at the top of the Viewport. For more information see Editing the Objects. New: Opens a new project. (If you made any changes to the current project, a message window pops up that lets you save your changes or skip saving if you don’t want to save your changes. A new project opens immediately after saving or skipping). 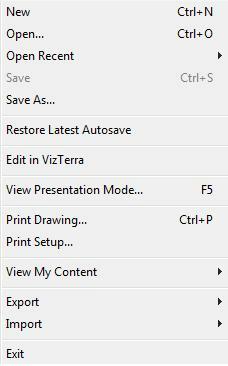 Export: This option will export your current drawing into another file format. My Content: This option will export your save files, screen shots, templates, and other content into a Content Package File ready to transfer to another computer or Pool Studio Member. Import: This option will import information from other formats into Pool Studio. Content Package File: This option will import a Content Package File into Pool Studio. AutoCAD File: This option will import an AutoCAD File into Pool Studio. This file must be in the DWG or DXF formats. For more information see Importing AutoCAD® Files. 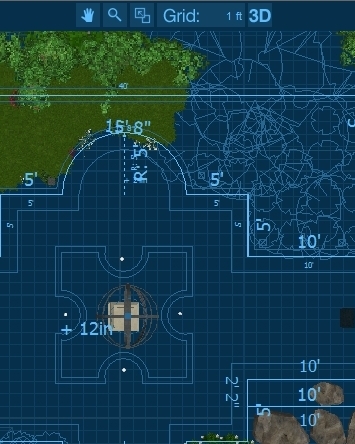 Landscaping: Allows you to access the stages of the Landscaping phase. 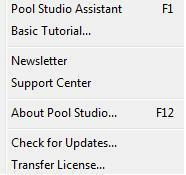 Pool Studio Assistant: Opens this help system, the Pool Studio Assistant. Newsletter: Connects you to the online Pool Studio newsletter for the latest information on updates and events. Support Center: Opens the Support Center at StrutureStudios.com in a new window. The Support Center contains the Knowledge Base of frequently asked questions, the Discussion Forums, and information on Training and Events, including a schedule of upcoming training sessions. This is the center of the online Pool Studio community. About Pool Studio: Information about Pool Studio including the current version number and your CD Key number and your video card information. Transfer License: Allows for a single Pool Studio License to transfer from one computer to another. For example, from a desktop system to a laptop system. For more information, see Transfer License.